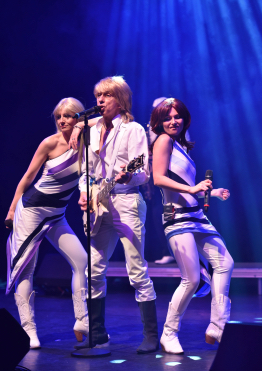 The Björn Identity ® Abba Tribute band & theatre production is based in Belfast and available worldwide and are undoubtedly one of the finest Abba tribute shows available to book this side of Sweden. Hailed as the best certainly in Ireland by their fans, having taken mainstream theatres venues by storm with sell out shows year after year, they have been capturing the hearts of audiences across Ireland & the UK since they launched their authentic recreation of ‘Abba in Concert’ back in 2010. As a full time, dedicated, professional Tribute show, their committment and delivery of Abba’s greatest hits is unrivalled on these shores. Simply – an Abba tribute band at the top of their game. Featuring professional trained singers & Musicians with experience performing in London’s West-End & International touring, they will astound you; not only in visual likeness, but with their incredible vocal & character studies in pure harmony and frighteningly close to the real thing. This show is, at it’s heart, the most authentic and experienced Abba band Ireland has to offer. With all the glitz of the classic 70’s era, featuring ALL of ABBA’s greatest hits, lesser known album tracks and always something extra for the fans! Widely known for their love of audience participation, The Björn Identity ® with their classic Swedish humour, will entertain and impress audiences from 8 to 80. When you book The Bjorn Identity for your event what you get is a tribute show that exceeds all previous expectations one might have of an Abba tribute act. This is an ABBA show for the fans, created and produced by fans of Abba. At larger events The Bjorn Identity will feature a guest saxophone player and children choirs join them tour, just like ABBA. Performing a catalogue of Abba’s greatest hits and lesser know ones for the FANS. The Bjorn Identity boasts 5 sets of authentic exact replica costumes; Ireland's ONLY Abba tribute show to feature Benny's white Yamaha stage piano, with giant gold Abba letters to complete to authentic abba concert look. Also available with high tech video AV show to add the wow factor to theatre and corporate events. "When you book The Bjorn Identity, ABBA will be there!" WHAT DO THE FANS THINK! Full on show from start to finish, & the crowd loved it! So, if you haven’t been to see The Björn Identity Abba Tribute Ireland, & you’re an ABBA fan, grab a ticket, you won’t be disappointed I promise! Absolutely incredible tribute to ABBA. Have seen a lot of tribute bands and none come close to these guys. These Supertroupers add sparkle to any do. Ikea hire them most years for their Crayfish Parties. Their performances are never flat! well what can I say. From the first song to the last it was pure gold. The band interacted with the crowd so well, everyone in the room felt special. If you are an Abba fan this is the must see tribute band, you actually think it is Abba on the stage. I saw the ‘real’ Abba (Dublin, 1979) and have seen a number of tribute acts. The Bjorn Identity are right up there with the best of them. They have clearly studied the costumes and the stage moves and they give a great night’s entertainment. Can’t recommend them enough. Very professional. Brought “The Bjorn Identity” ABBA tribute act over from Ireland to play a function at Eaton Golf Club Chester. They were amazing. Close your eyes and you would swear the original ABBA were performing, open them to a scintillating visual replication of the original group.